← Why do we all put up with Vandalism? Nuala gets her hair cropped! I have been asking Nuala for years, to try a shorter hair style. She has always said no as she had the idea in her head that short hair is for older people. Hair style is very important to Nuala and at home she went to the hair dresser, Linda in Westwood, every Saturday. Her excuse was that as she does not drink, it was one of her little luxuries! Since we have come away on this Gap Year she had not been able to get her hair done every week and it’s one of the big sacrifices she has made. In Paris she decided she would have to get her hair colour done and went off to find a hairdresser. She asked a number of women on the boats in the Arsenal Marina for recommendations, but none were forthcoming. 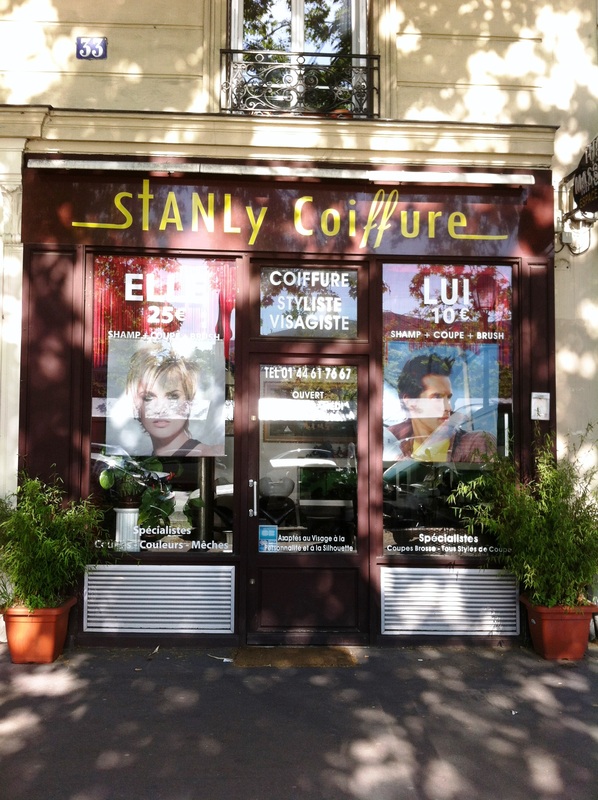 She visited a number of hair dressers and finally decided on Stanly’s Coiffeur after subjecting him to a full interview. (He will never realise how much information she got from him). She finally decided that he might be worth the risk. 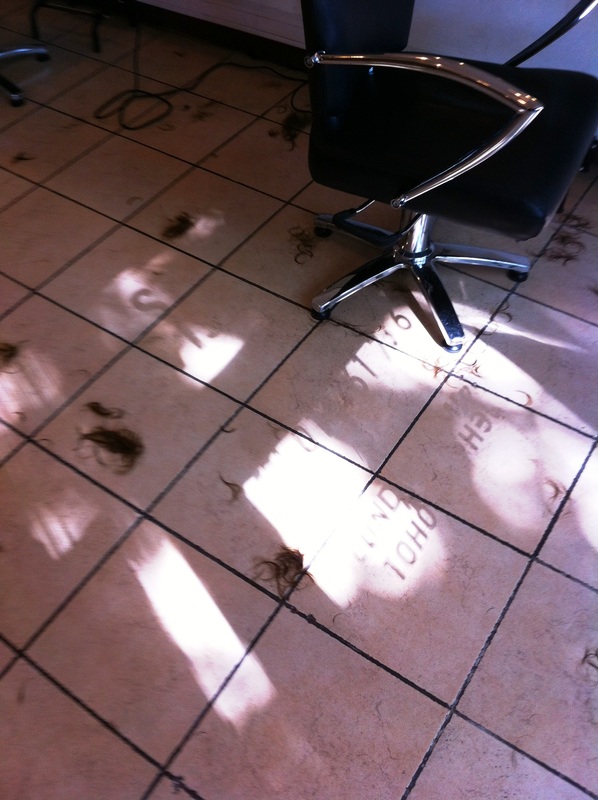 Nuala’s hair on the floor! I think it was him telling her that he was a stylist not a hairdresser that swung it for him. She booked an appointment for the following Monday (telling me that she would not be available for two hours from 10 am to 12.00). As this was a big event I decided to book lunch. I was very surprised when Nuala returned from the hairdressers with a short hair style. She had finally decided to take the risk. Another change that the Gap Year has brought. She spent the next week asking everybody did they like the new look. I love Nuala’s new style and once she washed it herself, she was happy with it too. It’s a wash and go style that actually works, she says! I know all the women reading this will be nodding in agreement and the lads will wonder why did he write a blog on this? Girls will you please explain to your men, how important hair and how it looks is to women! This entry was posted in On the Journey, Paris, People We have Meet on the Gap Year, Places visited and tagged Arsenal marina Paris, hair styles, Linda in Westwood, Stanly's Coiffeur. Bookmark the permalink. 16 Responses to Nuala gets her hair cropped! Thanks… and i have to say its is growing on me…and still is wash and go! Go on Adrian, let your hair down. I did when I retired, Cora thinks I look like a hippie but you should try it. Well done Nuala. 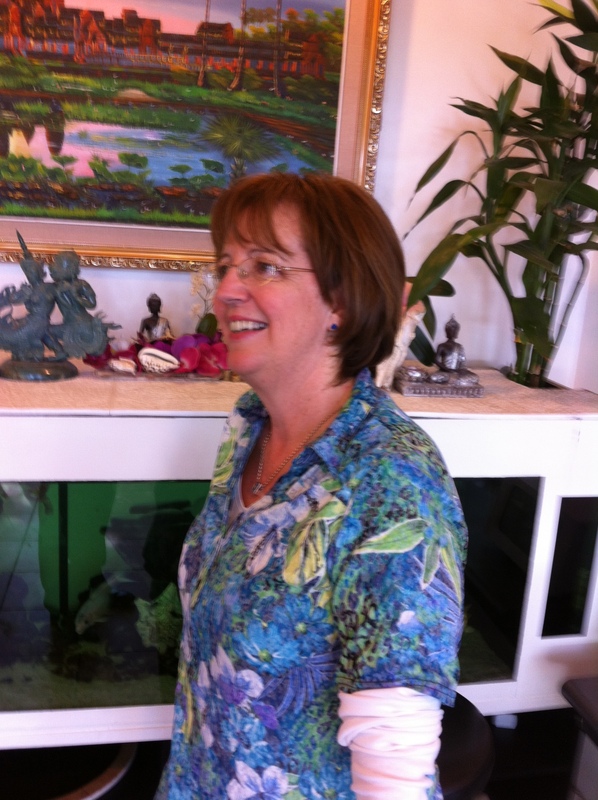 Nuala, you’re new hairdo looks fabulous on you….of course everything looks fabulous on you honey! Whenever I suggested to you that you cut it shorter you said that you couldn’t because Adrian preferred it longer and blonder…a little fib it seems! it was me who wanted the long hair all along! Very chic! Ooh la la! Looks lovely Nuala – now think of all the lovely things you can spend that extra money on!! yes i do really love your new hair style,its good to change your next port of call a little shorter. your blog is a terrific read. Hi Yvonne, delighted you are following us… i have to admit only done one blog, but will try and find time to do one next week. Hi to everyone and i will send them an email next week. Love the hair Nuala! Looks great, hope you are enjoying! Hi Claire , great to hear from you… will send email next week. am having a super time. cannot believe that 2 months nearly gone! i love the hair, and it is really wash and go! the main thing is Adrian loves it. Say HI to the girls..
thanks for the kind comments. how can i help you?